Children rush down the many slides at the Magical Bridge playground during the playground’s grand opening celebration on April 18. The playground serves both children and adults with disabilities and is fully wheelchair accessible. Photo by Veronica Weber. 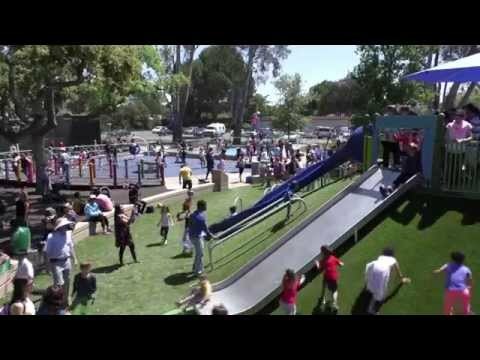 The Magical Bridge playground, one of few in the nation geared to the needs of adults and children with disabilities, opened in Palo Alto on Saturday, April 18, to a throng of hundreds of people. The playground at Mitchell Park goes well beyond Americans with Disabilities Act requirements to provide wheelchair access on merry-go-rounds and slides, in a two-story playhouse and on other play equipment. And parents with disabilities will be able to push their children on the swings. The $3.7 million playground is the brainchild of resident Olenka Villarreal and became a reality through the fundraising efforts of the grassroots organization Friends of Magical Bridge Playground. Magical Bridge has all wheelchair-accessible surfaces and different zones for activities, including zones for picnics, music, swings, spinning board games and tots. A sway bridge enables wheelchairs to access a tree deck for those who cannot climb a tree. The playground also offers amenities that are accessible to able-bodied children. On Saturday, plenty of kids and their parents without disabilities turned out to enjoy the recreational space. For the first time in their friendship, Malia Lamb, Lily Wride and Sophie Kim, all 8 years old, were able to play together in a playground, they said. "I've never gone to the park with them," Sophie, who uses a wheelchair, said. "Whenever I go to the park, it's not accessible. I feel like I fit in more (here)." Lily agreed, saying "We can all play together now." At other parks Sophie would mostly stay in her chair and read books while other kids got to play. She often felt like the other children saw her differently, she said. "I feel kind of left out at other parks. But now it's really, really, really exciting," she said. Andrew Kim, Sophie's father, said she had stopped enjoying going to the park when they go with her little brother. "There are lots of other kids like her in wheelchairs. It makes her feel more comfortable," he said. On a ground-level merry-go-round, Sophie can wheel her chair through a gate and spin around with the other kids. And she can make music with everyone else as she rolls through the laser harp, a metal arch that lets people pass through invisible "strings" that emit sounds at different pitches. "I'm awestruck. It came together so beautifully," said parent Emily McQueen, who watched her four able-bodied sons from her wheelchair. "I never fear that my children are gone out of reach." Parent Karl Garcia, who also uses a wheelchair, agreed. "I'm so excited. It's so accessible. I don't think I've been to the top of a slide in 30 or 40 years," he said. Now Garcia can communicate with his two 8-year-old daughters from their perspectives, he said. Magical Bridge provides a gift greater than the play equipment, kids and parents said. "It's amazing. I love how everybody can play together here, and it's free," Parker Bates, 11, who is not disabled, said. "It's a place where everybody can go, even people that do have disabilities. In parks like Johnson it's hard to have people in wheelchairs. They go into the sand and get stuck," Miller said. And making friends with kids who might not have his skills is important, he added. "It makes me feel good that I'm doing something to give back to the community," he said. Mayor Karen Holman just had to get a view from the top of the slide platform on Saturday, which has three different slides and a rope jungle gym. "I don't know when I've ever seen such a large turnout. ... This is such a remarkable day. This is going to be a landmark for many years to come," she said. Villareal decided to raise funds for the playground after seeing her own daughter was unable to hold onto the chains on a swing. Magical Bridge's swings now allow children to be easily secured in the seats, she said. Ninety percent of the cost was privately raised. Donors included families, schools, large donors and a bat mitzvah project. The Peery family and the Enlight Foundation each provided more than $1 million, she said. Magical Bridge was so much more than about building a playground, Villareal said. It was an opportunity to demonstrate the power of a community to "do something kind for an under-served community," she said. Villareal received a knock on the door one day with proceeds from six months of lemonade stands kids held, she said. The City of Palo Alto contributed $300,000 in seed money for the preliminary design. "The biggest gift was (city landscape architect) Peter Jensen. He made the connections with the city seamless, We didn't experience the red tape," she said. Then-city Parks and Recreation director Greg Betts admitted that although the city's parks are ADA-compliant, that's just a checklist of things to follow that don't have much to do with utility, Villareal recalled. "He said, 'We used to build parks and do a walk through. What we should be doing is a roll through,'" she said. Villareal said that only 10 percent of people with disabilities are wheelchair users. Ninety percent have other types of disabilities. "One in 54 has autism. We want to spark a national conversation that parks should not only be ADA accessible but inclusive," she said. Magical Bridge is not the first playground for people with disabilities, but perhaps it is among the most elaborate. The playground has "quiet" benches and safe bubble seating where children with autism spectrum disorder can retreat when sensory stimulation becomes overwhelming. For parents such as Kim Mansfield, whose son Colin, 5, rarely gets out to play with other children, Magical Bridge has opened doors. Colin, who has cerebral palsy, rang the artfully designed bells in the tot park. The apparatus allows the boy to make music while strengthening his arms and practicing standing. Colin grinned as he listened to the sounds he could make, moving from one bell to another. "He's pretty happy here. He's usually pretty scared at the park because there's not a lot of support for him," she said. Once fearful of swings because he thought he would fall, Colin now loves the swings at Magical Bridge, which embrace him with a safety bar, she said. But most of all, Mansfield and Colin have a chance to make new relationships. "Other than in and out of therapy, we don't really have friends and other children that can play at his pace," she said. On Friday night, Katie Spier couldn't sleep, she was so excited, her mother, Mimi, said, as Katie ran back and forth to the slides. "To have everyone in the community support us is great," she said. Magical Bridge also gives children with disabilities a new found sense of empowerment and control. "They are always trying to make their way in everyone else's world," she said. To see what other playgrounds for children with disabilities look like, click here. To see a social media collection of photos from the event, visit the Weekly's Storify page.